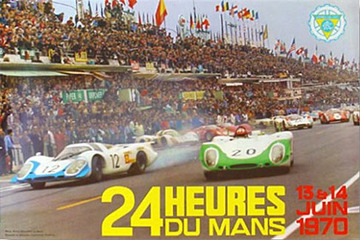 The 1970 24 Hours of Le Mans was the 38th Grand Prix of Endurance, and took place on 13 and 14 June 1970. It was the eighth round of the 1970 World Sportscar Championship season. As the race saw the factory teams entering four Ferrari 512S and five Porsche 917K, plus another nine of these 12-cylinder powered sports car entered by privateers, and provided the background for the Steve McQueen movie Le Mans, the 1970 Le Mans race is also called Battle of the Titans.